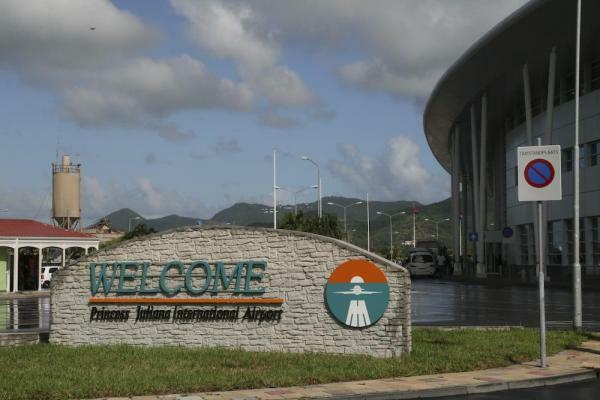 Arriving in Sint Maarten, the Juliana airport is very clean and modern, and we were surprised to see our luggage again. (unlike the line-up of 50 or so people waiting in the lost luggage line-up, from another LIAT flight). We shared a taxi (which they arranged) to our backpacker hotel in St Martin for about $20. After coming from Dominica, St Martin/St Maarten is a different world. There is development everywhere – casinos, restaurants, shops, fancy hotels… It didn’t take long for us to be extremely glad we were only staying one night. Crossing from the Dutch Sint Maarten part of the islands to the St. Martin French side, there is no evidence at all that this is a different coutrny – except for the small sign we sped by as we crossed.